Having spent more than a half-century pursuing my own happiness, I decided to conduct a Happiness Survey to learn what other people truly desired in life, too. For several years, I queried hundreds of individuals on the topic of happiness. What began as a “Maura4u Happiness Survey” for women 50 and older quickly expanded when I realized that others were anxious to express their perspectives on the subject. The results of my survey produced a grand patchwork of nearly 1000 respondents, 65% female and 35% male. They weighed in as young as 18 and tipped the age spectrum at age 90+. These reflective individuals hailed from 28 states across the U.S. and 23 countries around the world. Their personal backgrounds proved just as diverse. They were single, married, widowed, divorced or engaged in a personal relationship. Some were from rural areas and others lived in cities. Educational credentials (and, though not queried, their accompanying presumed incomes) ranged from high school diplomas to university PhD’s. After completing generic information, each candidate was asked to describe their idea of happiness using 50 words or less. As the results poured in, I discovered great commonalities. Like me, these people believed that happiness is found within. They were aware that happiness wasn’t to be pursued as an external or elusive quest, but that it arose instead from choices and intentions of the heart. According to these participants, happiness was found when internal, rather than external, factors were at play that could be emotionally felt and personally experienced. Eventually, I distilled these Happiness Survey narratives into a workable and definable consensus. Not surprisingly, differences in age, geography, culture, marital status or education don’t seem to change the universal ideas of what constitutes personal happiness. In our quest to fit in, run after shiny objects, respond to external stimuli or merely keep up with others’ ideas of success, we forget to take personal inventory. We neglect the one individual who has a sense of what inner happiness is: ourself! In my newest podcast, I share a bit more about this Happiness Survey and talk about the need for each of us to find and follow our internal GPS to happiness. By allowing ourselves personal reflection time to discover and enumerate those things we truly want, we can choose to focus on what’s important to us — rather than what’s not. With proper focus and intention, each of us can eventually learn to “be” ourselves and, therefore, find greater happiness and contentment in life. Enumerating our own desires helps us move toward what we truly want and away from what we don’t. Non-supportive elements like toxic relationships, purposeless pursuits and misplaced behaviors begin to dissipate, change and rearrange. In their stead, new people, pursuits and ideas that support what we truly do want begin to emerge. An inward life arises that helps us pave a path toward personal peace, purpose and well-being. In this way, we’re living happy – from the inside out. Listen here to Podcast 092 World Happiness Survey. 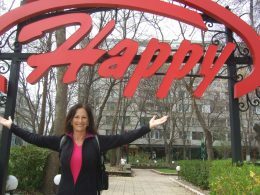 Be inspired by my Happiness Survey that summarizes what others are looking for in life – or create a list of your own. Once you have crafted your own list of what you really want in life, plan to keep these positive desires in the forefront of your mind. Use them as daily guideposts to keep you on your path of living happy from the inside out. Watch a video filmed in London where I ask, Where is your happy place? Watch another video filmed in North Carolina where I ask, Where is your country road? Read my blog entitled, Surveying the Backdrop of Our Mind. For more serious students, check out my Foundations of Happiness self-study course. Using the Happiness Survey as a cornerstone, this multi-media course is filled with personal stories and reflective questions designed to challenge your mindsets and empower you to live your happy life – from the inside out. Wishing you greater happiness in life, each and every day.